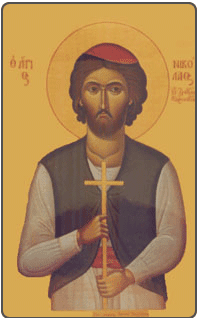 In the year 1930, a Neomartyr named Nicholas of the 16th century who was forgotten by the Church was revealed. 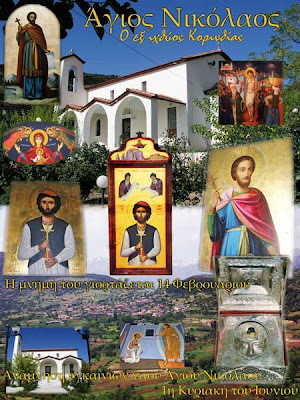 Metropolitan Ezekiel of Thessaliotis, who, on a routine tour of the monasteries of his diocese, discovered a manuscript in the deserted Monastery of the Holy Trinity, also named Siamou, on Mount Pindos, which contained the service, a synaxarion, and a sermon in honor of this New Martyr, all of which were authored by his contemporary, Subdeacon Damaskenos the Studite of Thessaloniki, who later became Bishop of Rendini. All these were copied by Metropolitan Ezekiel, who dedicated the manuscript to the School of Theology at the University of Athens and published them. The first Greek edition of Metropolitan Ezekiel, titled "Service to the Newly-Appeared Martyr Nicholas of Ichthys of Corinth, with a Prologue by Metropolitan Ezekiel..." was published by Phoinikos Press (1930) at Stadiou 44 in Athens [download book here]; a reprint was published at Corinth by Chrestos Skouteres (1963). 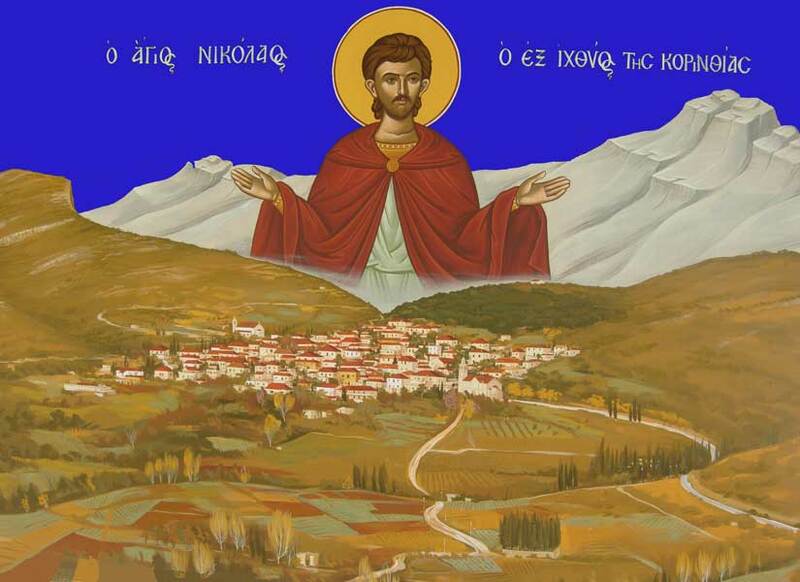 The hymnographer of the Great Church, Father Gerasimos Mikragiannanites, also composed a service to venerate this Saint. Nicholas, the newly-revealed and courageous Martyr of Christ, was born in an obscure hamlet, called by its neighbors Ichthys or Psari, which was within the prefecture of Corinth. His parents, John and Kalli, were pious and faithful to Christ. When the holy lad was twelve years old, his parents departed this world. Since he was left alone at home, the boy could not endure the absence of his beloved mother and father. He, therefore, departed his hometown in the company of several youths. They were bound for the town of Selybria, which is a day's distance from Constantinople. Nicholas entered the service of one of Selybria's prominent citizens as a valet. The fear of God was in Nicholas' heart, and he kept the commandments of Christ with zeal. Along with the fulfillment of his duties, he supported the parishes in the area according to his means. Nicholas had a good and pious upbringing. He wished to establish a Christian home. When he reached a suitable age, he entered into lawful wedlock and fathered children whom he reared in the Greek Orthodox tradition and the teachings of Christ. His godly children were fruit that bore witness to the tree, even though they were brought up in a worldly environment. While engaged in a livelihood of selling fruits on the main street of the town, Nicholas did not neglect the salvation of his soul. He ministered to the poor and pleased God by distributing alms. He, moreover, attended services in the nearby churches. Nicholas, however, aspired to achieve a greater gift (that is to say, martyrdom), and this story tells of how it was attained. Now Sultan Suleyman I (1520-1566), in the thirty-fourth year of his reign, had embarked on a campaign in Persia. At Constantinople the sultan left in charge his prefect, a certain Sinan. This man, who had nothing to commend him, would boast of his kinship with the sultan and tyrranize his subjects. He was overbearing in his position and committed more firghtening and barbarous acts against the Christians than one can imagine. He condemned some Christians to serve as galley slaves on pirate ships, while others he terrorized with threats of punishment. At that time, the godly Nicholas was despised by the Turks in his neighborhood. They resented his industriousness and ability to sell more produce than they on the main thoroughfare. Nicholas, consequently, was taken into custody, and led forth to Constantinople. The Christian stood trial before the prefect; without weakening in the least, Nicholas confessed that he was a Christian, calling the Hagarene (Muslim) religion false. As a result, by order of the prefect, Nicholas received such a severe beating with branches from a pomegranate tree that the blood ran forth even from his toenails. After this terrible torture, he was cast into prison and received no medical attention. The year was 1554. Four days later, the judge took him out of his cell. The Muslim prefect, by flattery and the promise of an important position, attempted to persuade Nicholas to deny the pure Faith of Christ. But the villain accomplished nothing, for Nicholas, the martyr of truth, became even more adament in the Orthodox Faith. The martyr invoked the name of Christ, thereby chastising those godless ones for their unbelief. He called their false prophet the son of the devil and an enemy of God. After hearing this declaration, the Muslim's bound chains around Nicholas' neck. Instead of garments, they put a woven mat about his body. In this condition, the executioners paraded him throughout the city. Nevertheless, neither did this form of torture induce the Martyr to yield; rather, his sufferings strengthened him in the Faith. By order of the prefect, the Muslims lit a great bonfire in the hippodrome, to which the proponents of impiety led the Martyr. They, however, did not throw him into the fire immediately; instead they cruelly exposed his body, little by little, to the flames. This was done to prolong the severity of his suffering. After the Saint was subjected to this torture for a long period of time, he could no longer hold himself upright, so he leaned to the right. The executioners removed the chains, which he wore about his neck, and severed his head with a sword. Thus, Christ's valiant witness and martyr surrendered his soul into the hands of God. His honored body was burned in the fire and his soul departed into the hands of God. Only his sacred head remained intact. It was purchased by a devout man for twenty golden coins, by which he bribed the executioner. This honorable relic was sent to the Thessalian monastery of our Holy Father Athanasios of the Great Meteoron, where it is found to this day, being a source of many miracles, to the glory of Christ, our true God, to Whom is due glory unto the ages of ages. Amen. From The Great Synaxarion of the Orthodox Church, translated by Holy Apostles Convent, pp. 634-636. Read more about St. Nicholas in Greek from his church in Corinth here.